Recurring donations allow you to take monthly recurring donations via your CauseVox campaign site. You can easily turn a small donation into a consistent stream of donations throughout the year. **Please note that, CauseVox currently supports recurring donations via Stripe only. Step 1: Go to your CauseVox Admin. Step 2: Click on the campaign you want to enable this feature for. Step 3: Click on Settings on the menu at the top of the page. Step 4: Make sure that your Stripe account is connected and selected as your donation processor. Once selected, your recurring donation options will appear. 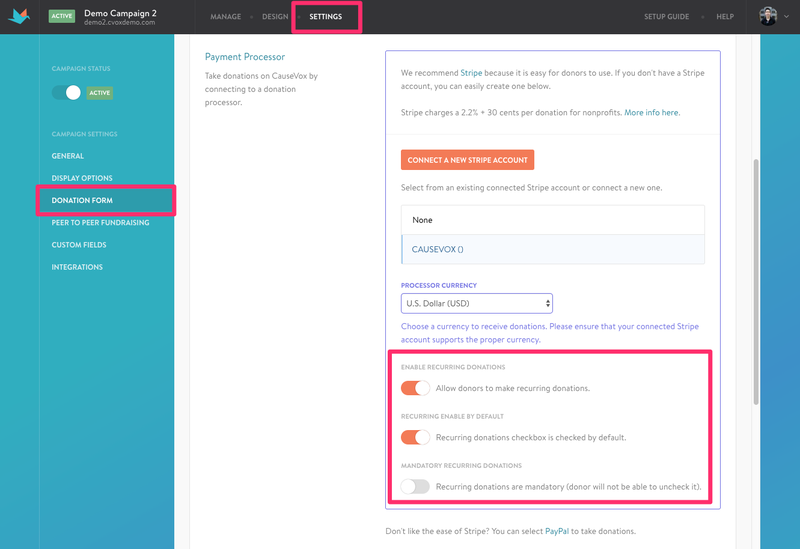 If you don't have Stripe set up yet, here's how you can set up Stripe for donation processing. Step 5: To give donors the option to make their donation recurring, turn on "Enable Recurring Donations." To default all donations to recurring, to encourage monthly gifts, turn on "Recurring Enable By Default." If you're running a recurring only campaign or donation page, you can enable "Mandatory Recurring Donations." Step 6: Save your settings. All settings will then be updated on the campaign.